It brings me great pleasure to welcome you to our investor relations web section. For our existing shareholders I say "Thank You" for your confidence and support. And for you prospective investor; keep reading and I hope you discover that the AirAsia success story is nothing more than a combination of focus on consumer needs, dedicated staff, hard work, getting the basics right, cost control and the passion to be the best! We focus on really understanding consumer needs and problems. By increasing our consumer insight, we are able to develop new products that solve these needs and problems. For example, it was because of our guest's suggestion that we decided to have multiple languages in our websites - something of which we are eternally grateful. It might seem like a simple suggestion, but the results are phenomenal. To date, over half of our sales are via internet booking and it is steadily rising. My philosophy is very clear: before a business can grow, it needs to have its costs under control. It must be cost-efficient & profitable, and it must create value. "How much lower can your cost reduce?" My direct answer is if we do not strive to be more efficient and choose to be complacent - our days are numbered. This is a continuous task we have to face head on year on year; it is the critical ingredient to operate a successful business. Cost-efficiency, low complexity and profitability are always the cornerstones of building a strong business. While a strong foundation does not guarantee a solid house, it is the only basis upon which to build. So, we will continue to be dedicated to cost-efficiency and expansion. It is a message that is well understood by each AirAsia employee and I am proud to say this is our culture. To the consumer, a strong AirAsia brand is a sign of dependability and leadership, giving added confidence and assurance. 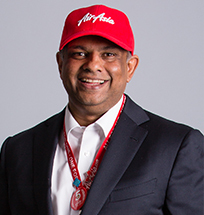 AirAsia will not just be number one in size; it will be number one in the minds of consumers. This is the passion of AirAsia and trust me, we will never lose sight and passion of being the best.